The big day for turkey may be right around the corner but December is the month of ham. A great many people, when asked to conjure up a memory of a cozy and glorious family dinner past, will recount a holiday dinner that features a centerpiece glazed with honey or studded with cloves; the meaty leftovers served on soft, homemade rolls as a snack late that night or for lunching in the afterglow the following day. Ham is something we have a special place for on our table and something that has a rich culinary history in this country – and in many other parts of the world, in one form or another. In the United States, the two major types of ham are dry cured or “country” hams and wet cured or “city” hams. 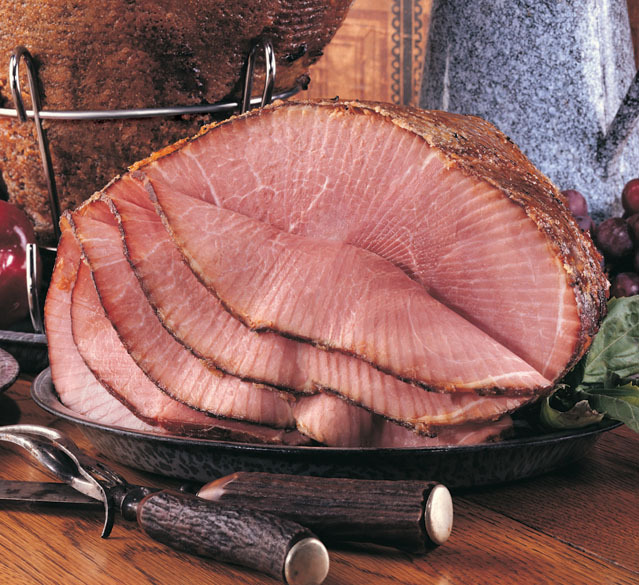 Dry cured hams have a stronger, more salty flavor and are popular in the Southeastern US. These hams are often soaked for a day or two before cooking to remove the excess salt. Up here in the northwoods of Wisconsin, people traditionally prefer wet cured hams. Nueske’s specialty is wet curing hams in a brine and then slow-smoking them in the Nueske family’s traditional manner: over glowing embers of sweet Wisconsin applewood. These wet cured, applewood smoked hams are easy to prepare and are Midwestern favorite because of their smoky, mellow flavor. Hams can be large or small, sliced or unsliced, or hand-glazed with honey and spices. Whatever type of ham you and your family enjoy for your upcoming holiday meal, we have a large collection of recipes to help you use up the leftovers… if there are any.